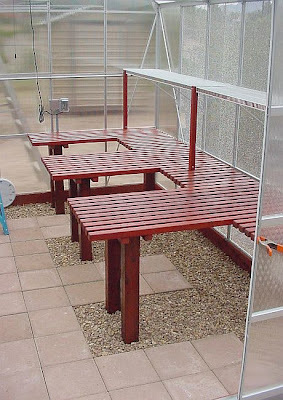 I wanted a long bench on each side of the greenhouse, and several additional peninsula-style benches attached to the south bench. I was thinking of simple pine 2x4 frames with a hardware cloth top, but my husband’s design was much more graceful. 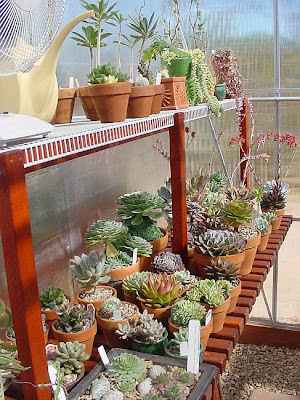 They should provide lots of space for pots on top, and lots of free space underneath. They aren't movable, however, so I spent lots of time scribbling on graph paper before we started, and it took a little math! 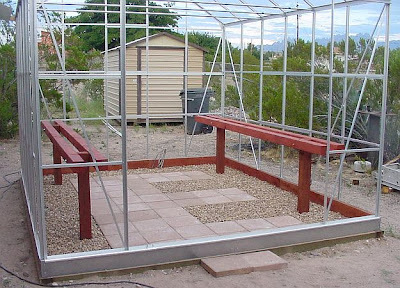 We started the greenhouse benches before the greenhouse panels were up (much cooler for us to dig the concrete footings.) 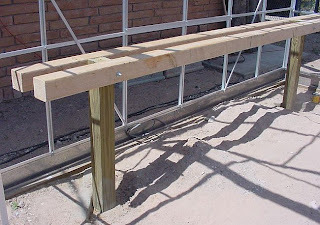 Each long side bench is supported by two pressure-treated 4x4s, buried 24" deep and set in concrete. The next day, two horizontal Douglas Fir 4x4's were clamped to either side of the two pressure treated posts. We checked for level, and then temporaried with long screws. The horizontal 4x4’s were attached by using a 12" long 3/8" drill bit to drill a hole through all three 4x4's. A length of 3/8" all-threads rod was inserted in the hole, and capped on each end with a washer and nut. The completed bench support for the north wall. It’s a bit over 10’ long. When the redwood slats are added to the top of the horizontal 4x4's, the benches will be 30” tall. Bench supports after staining. 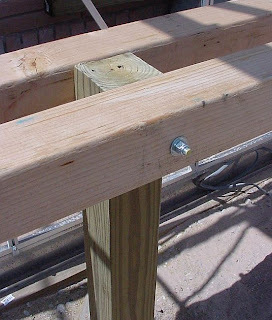 The posts are pressure-treated pine, the horizontal beams are fir, and the top horizontal slats will be redwood. I used a redwood-colored stain to blend the different woods together. I doubt the color will hold up to our sun, but it’ll look nice for a while. The floor is also in place in this photo. The 12" x 12" concrete pavers weren't very expensive, and should be easy to walk on. We chose gravel in a color complementary to the pavers, and in a size large enough to not get constantly stuck in our shoe treads. Eventually, we'll do some kind of outdoor threshold to eliminate stepping over the greenhouse frame base. I trip over that daily. The slats for the bench tops were ripped from 2” by 6” by 12’ redwood. Each resulting slat is 1 ¾” by 1 ½”. We knocked the sharp edges down with a rasp, and sanded them. We used a template to mark the location of the screws, and drilled pilot holes with a drill press. They were sealed with two coats of stain before attaching, and one more coat on the top surfaces after installation. I used a penetrating oil waterproofing sealant, Olympus Maximum Redwood Naturaltone. 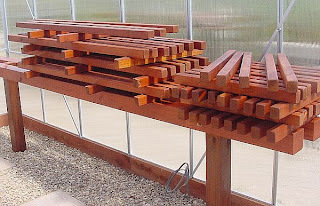 Here’s a pile of redwood slats waiting to be installed. Slats are laid out and temporarily propped up before we build more legs. We decided to cut a few more slats to reduce the spacing between the slats to roughly 3/4"...it seemed less tippy for small pots. Completed bench on the south side, with 16” rubber-coated closet shelf from Lowes in place.I bought the “close mesh” which has ½” spacing between the wires. 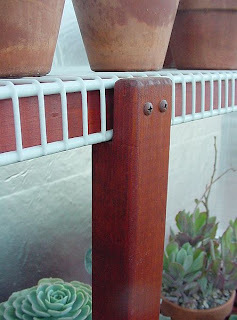 The standard mesh has 7/8” spacing between the wires, and I thought that would be too tippy for 4” pots. So, we used a combination of ClosetMaid braces (the thin white diagonal braces barely visible in the photo above) and wooden support posts. 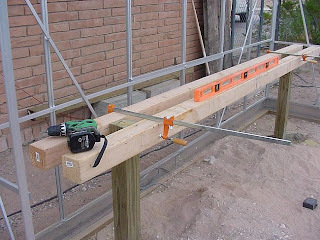 First, we positioned the shelf so it sat directly on top of the horizontal wall braces (Part 30) and secured it to the top of the hollow brace with screws. We added a 1”x2” piece of wood behind the front shelf edge to strengthen the outer edge, and to give the posts something to support. The vertical 2x2" posts were notched at the top so the shelf weight sits directly on the post. 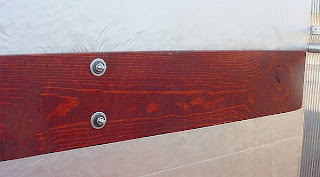 Screws go through the post front, through the shelf front, and into the 1x2 wood, tying all three parts together. The bottom of each vertical post is also screwed to the top of our wooden benches. There were a few spots requiring the use of bolt cutters to notch out some of the wires, to avoid diagonal wall braces. In one corner we were able to also support the side of the shelf by resting it on the horizontal braces of the back wall, but we also added a wooden post as well. This is how it looked after I moved the plants onto the south benches and south shelf. We had to locate the wall studs behind the foam insulation, and cut small holes through the insulation to insert T-bolts into the studs. We found we had to use bolts that varied from 2 ½” to 3”, depending on where they were in the wall. 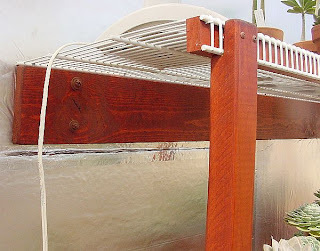 The back of the 16” ClosetMaid shelf rests on the top edge of the 1x6”, and is attached with screws into the top edge of the wooden board. Then we attached a wooden1x2 to the front of the shelf, just as we did on the south side shelving. Finally, we added three notched wooden 2x2" posts to support the shelf weight, and screwed them to the wooden benches below. This is how the north side looked after moving the plants in. 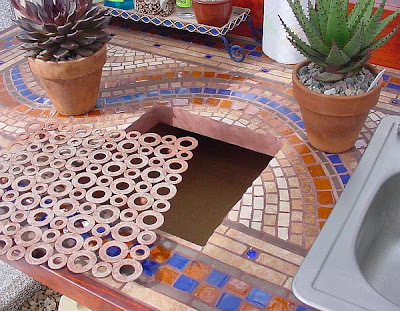 We also planned a potting area with sink on the north wall. 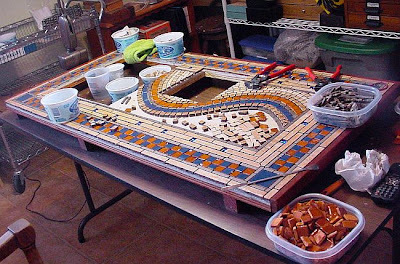 I decided to try my hand at a mosaic countertop. I had a lot of floor tile pieces left over from our house, and other odd tile scraps. I had fun doing it (and I learned a lot about what a challenge it can be to keep the tiles of varying thicknesses even and smooth on a countertop!) Here is the countertop in progress in my work room. The finished countertop and sink installed. The sink drain isn’t connected to our house plumbing. It drains into a gravel pit we dug in the floor, and the soil beneath the gravel is the coarse sand of our yard. Another option for the future would be to route the drain water through the wall of the greenhouse and outdoors, to water a planting bed. 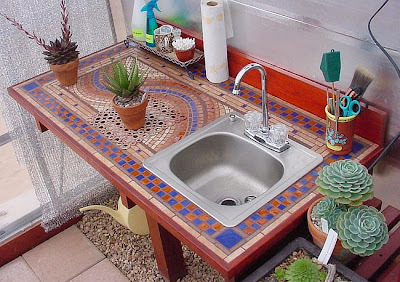 In addition to the sink, I also have a faucet under the bench where I can attach a hose. I can brush potting soil into the hole in the center, where it falls into a plastic bin below. I keep the hole covered by a removable grill. It's actually a cheap metal trivet I bought at Hobby Lobby, painted it with acrylic paints to blend in a bit with the tile color. That's the benches/shelves/sink to date...I have a feeling I'll eventually add another tier of low shelves under the benches for shade-loving plants. There's never enough room for plants. The north wall of my greenhouse allows very little light because it faces our house. I decided to install insulation on that wall to reduce the square footage of walls that would easily lose heat in the winter. Many folks install opaque insulation on the north wall, the lower half of the north roof, and partial sections of the other walls, but for this year I'm starting with the north wall only. Let's pause here for an Embarrassing Newbie Admission. I'm having a bit of a hard time with the looks of all the best insulating and heat-reflecting materials. Sometimes I worry my greenhouse will look more like a NASA laboratory than a pretty gardening space. (No offense, NASA.) 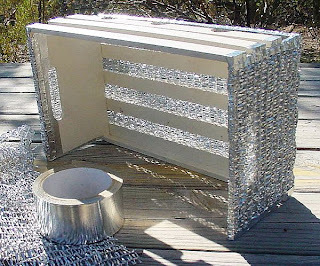 I figure one winter of high heating bills will cure that; come Spring, I'll be slapping reflective foil insulation and bubble wrap everywhere. OK, back to more serious details. Tip: Before installing the insulation, now would be a good time to do any last-minute checking for loose bolts, or gaps that need caulking. Our first rain did reveal some gaps in the frame (especially at the top of all four corner posts, and at the seam in the center of one gutter, which allowed some water to run a central wall stud.) 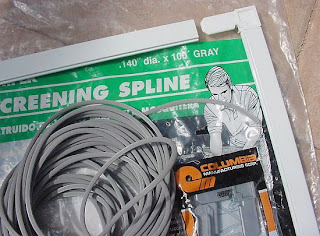 I'm using a gray silicone caulk made for caulking aluminum. We used polyisocyanurate foil-faced foam sheeting. I couldn’t find 1” thick, so we used ¾” thick, which has an R-value of 5. I purchased three 4’x8’ sheets at Lowe’s for about $12 each. Mine had foil on one side, facing the interior. My plan was to install three pieces vertically, but I found they couldn’t be maneuvered into place because of our EMT braces overhead, and our bench supports below. (These insulation panels don't flex, and they're brittle.) Instead of unbolting the bench supports, I cut the pieces differently. I used an X-acto knife to notch around a few of the EMT braces at the top of the wall. The inside surface is foil, but the outer side is a plastic/paper sheet with big blue lettering that looked awful on the outside of the greenhouse. So, I rolled a coat of white paint on the outside of the panels to cover the lettering. When the panels were back in place, I covered the seams with aluminum tape. I hoped the fit would be so perfect the panels would just wedge into place, but no luck. I found I needed to add a few screws with washers to keep the wall of insulation snugged up to the frame. We aimed for the hollow horizontal braces, pre-drilled a hole through the foam and the brace, and inserted a screw and washers in a few spots. Update: I later needed access to the greenhouse wall studs to hang shelves on this wall. It was tricky to work through the foam insulation to do so, but possible. We were able to locate the wall studs and cut small holes to insert long T-bolts into the channel. Then we installed 1 x 6 boards to equalize the pressure on the foam over a larger area, and we attached the shelves to those boards. Not easy, but I don't think trying to fit this foam insulation around shelves would have been easy either. One more note about this foil-faced insulation. The foil acts as a radiant barrier, and I've read you defeat the purpose of this barrier if you put anything directly on top of the foil (touching it.) I'm not in love with the look, as I've said, but I've determined that I could cover it with another material if I used some sort of spacers to preserve the air space in front of the foil. If I find the reflective surface increases temperatures in the summer (yet to be determined) I could simply hang a fabric drape in front of it, removing it for winter when I'll probably enjoy the light it reflects back into the greenhouse. We added three GFCI (ground fault circuit interrupter) outlets, because they’re recommended for greenhouse use. Also, I accidentally had one outlet installed against a panel that was later replaced with a screen, which potentially exposes the outlet to rain. That outlet will now have to live in a plastic bag when the screen is in place. Moral: think ahead as much as possible! We installed in-use outlet covers; these have a hinged lid, and an opening for the cords to pass through, so the outlet is protected from water even while being used. 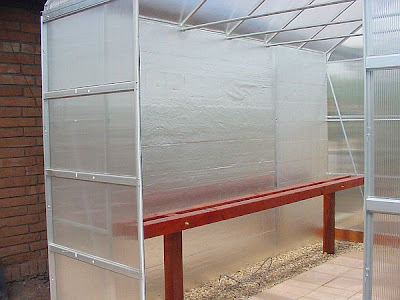 I wondered if the in-use covers were necessary in a greenhouse full of cacti (no misting or spraying in my plans) but then I realized my plans to add screens would allow rain in the greenhouse. Also, one of my outlets ended up under a shelf of plants, and the outlet cover ensures that no water splashes from watering my plants will end up in that outlet. The only problem I've encountered with these in-use outlet covers is that they will only close over normal standard plugs. I didn't plan on using anything else, but I later bought thermostats that utilize a piggy-back plug system (the heater plug goes in the back of the thermostat plug, which results in a very long combined plug!) As a result, the covers won't close, as shown to the right. That's something to keep in mind. 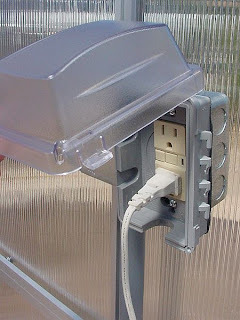 ¾” PVC conduit was used to protect the wiring. The conduit was attached at the ground level by screwing into the wood of the foundation. We secured it above by putting screws into some of the horizontal wall braces. 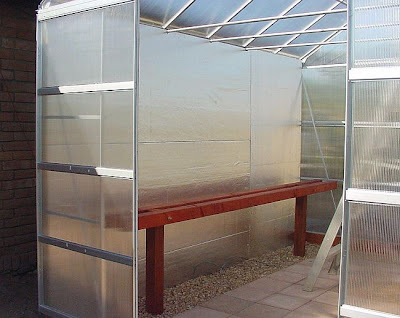 The soaring temps in the new greenhouse (130° with the doors and roof vents open) told me I’d be needing shadecloth (and more) to lower the heat. I ordered Aluminet reflective shadecloth from IGC. It comes in different densities, and I chose 40%. 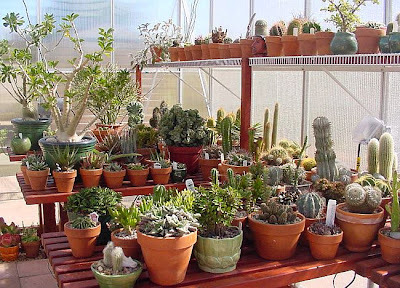 I agonized over the choice, but I read that 40% was used by several cactus and succulent greenhouses, and I was worried that a heavier density might block too much of the light my plants need. Time will tell. 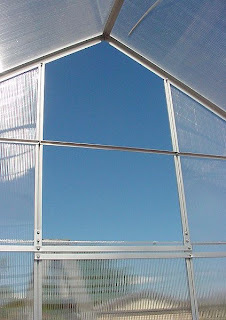 Some people make screen panels to replace the regular polycarbonate panels in hot weather. 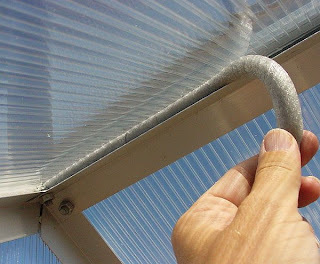 I wanted to try screens using Aluminet shade cloth as the fabric (for shade and air ventilation at the same time.) 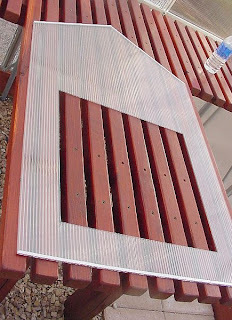 I used do-it-yourself window screen components (Home Depot or Lowes) as shown in the photo above. 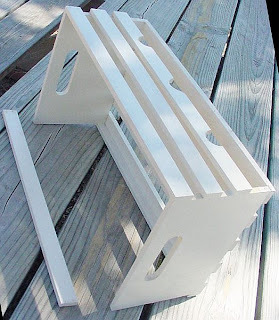 You cut the metal frame to length with a hack saw, and plug plastic corners into the ends. 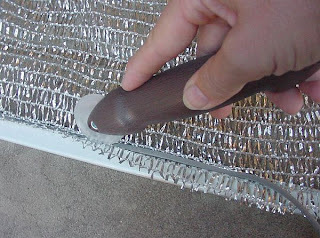 The fabric is attached with plastic spline pushed into the groove, using a spline tool. Brace Tip: I had to build two cross braces into each panel frame. Without the cross braces, the stretchiness of the Aluminet bowed in the long sides of the frame …over 1” on each side. 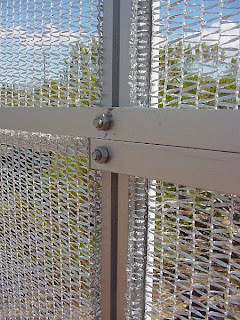 The cross braces are attached with small metal clips purchased separately. In my kits, they didn’t stay in place until I added the fabric and spline. Measuring Tip: The plastic corners add ¾” to the length of each side, but my directions said to “subtract 1 ¾” from your desired length” to compensate for both corners. That didn’t make sense ( ¾” plus ¾” equals 1 ½”) but I followed the directions. Sure enough, my first screen was ¼” too short and ¼” too narrow to fit well. So, just determine the final screen length, subtract 1 ½” for the length added by the plastic corners, and cut the metal to size. Density Tip: I now have Aluminet stretched in screens in some parts of my greenhouse, and draped loosely in other parts. 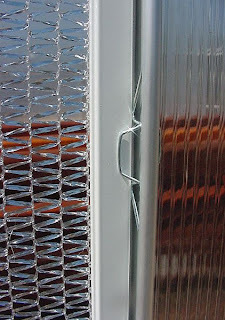 The Aluminet installed in screens lets through a bit more sunlight, since the stretching opens the weave a bit. You might keep this in mind when deciding which density to order, if you're planning to use it in screens. I cut the cloth so it was roughly 1” larger than the size of the screen frame. The 40% Aluminet was easy to secure with .140 size spline. I’m sure higher densities of Aluminet are thicker, but this material is so soft I think they’d still work. If it seemed too thick to fit into the groove, you could try smaller spline. I secured one long side first, top to bottom. Then I did the other long side, but this side involved pulling and securing a few inches at a time (stretchy stuff) so I started in the center and worked towards both ends. The top and bottom were last. Aluminet has lines in the weave, and it stretches in the direction that’s perpendicular to the lines. In my screens the Aluminet lines ran vertically (the least stretchy way) but I think it would work in the other direction as well. It’s possible the cross braces wouldn’t be as critical if you installed the fabric so the most stretchy direction went lengthwise, instead of installing it like I did. 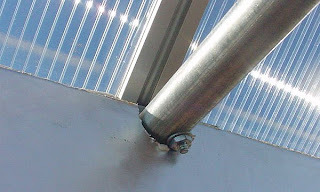 Also, Aluminet has a seam every 7 feet, and one of my panels includes the seam. It didn't cause any problems, so you don't need to design around the seams in the fabric. I trimmed the excess fabric with scissors, leaving about ½” edge (thought it might pull out if I trimmed it close.) The photo to the right shows how it looks inside the greenhouse. 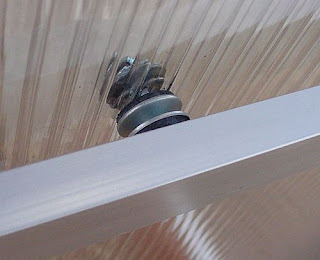 I attached the Aluminet panels with the same glazing clips that secure the polycarbonate panels. When I made the screens, I was careful to position the cross braces so they would line up with the horizontal braces inside the greenhouse. I thought I might need to attach the screens to the braces with screws, using the same screw holes I use to attach the poly panels. However, I found the clips worked great by themselves. Tip: I numbered each polycarbonate panel with a permanent marker before removing them. We didn't center the self-piercing screws carefully when we attached the panels, so now I have to put each panel back in the same place to make sure it lines up with the drilled hole in the horizontal braces. 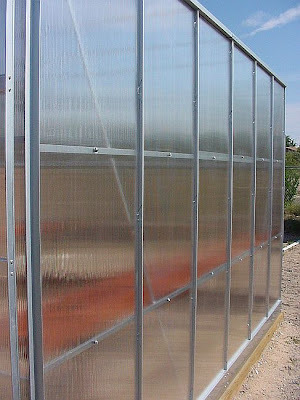 Okay, two-thirds of my south greenhouse wall is now Aluminet panels. I love the clean appearance and the increased ventilation! Before installing these, the temperature in my greenhouse was at least 130° with the doors and all four vents open; with these panels in place, it’s closer to the outside temperature. Installing the roof shade cloth and exhaust fan should help even more. I'm tickled pink with how these turned out! 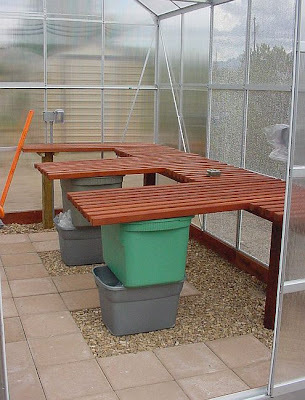 Of course, summer rains will easily penetrate the screens, so I’m aware of what I put on that side of the greenhouse. Annually, we have lots of heat and little rain, so it should be a worthwhile trade-off for me. 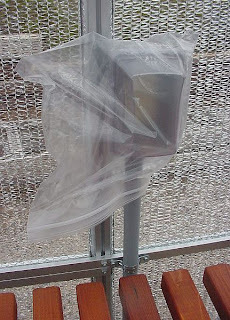 I’ve thought about a clear plastic curtain on the inside of the south wall to be pulled into place during heavy rains. Here’s what happens when you don’t consider screen placement when doing your electrical. Although we used GFIC outlets and in-use outlet covers, I didn’t plan on the back of the outlet being exposed to rain. I’ll have to figure out how to weatherproof the back, or live with a baggie over that outlet in the summer. Darn. When the fall night temps get too cool, I’ll remove the screens and replace the polycarbonate panels. I tried leaving the screens in and putting the poly panels on top, but the combined thickness of the two layers won’t allow the glazing clips to fit in the channels. Later I discovered I could put the polycarbonate panel back in place, with clips and screws as usual, for protection from cool night temps. And, if I still need a bit of shade for a while longer in the season, I can put the screens back on TOP of the poly panel, and I can make them stay in place by inserting clips into the gap backwards (photo soon.) Yes, it looks odd, but hey, it works. After I get a bit deeper into the winter season, I'll take the screens off again so I can have all the sun possible. The cost for each 6 ½’ tall frame was about $12 (not including the cost of the Aluminet.) 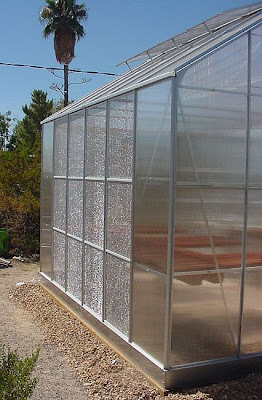 Of course, once you have the screens, you'd be able to swap out the Aluminet for different densities, or even replace it with regular screen material, bird netting, or whatever you wanted to be creative with. We used this fan calculator to determine that our greenhouse would require a fan capable of exchanging roughly 1500 CFM (cubic feet per minute.) 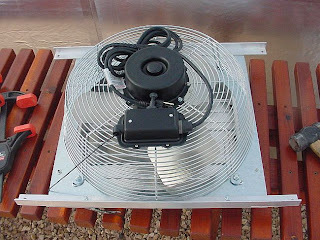 I ordered a 16” three-speed louvered exhaust fan from ACF Greenhouses. 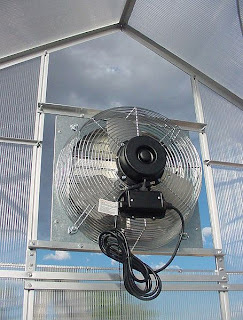 The three speeds are capable of 2950, 2050, and 1200 CFM, so at the highest setting it should exchange the air in the greenhouse about every 30 seconds. I wanted at least one air exchange per minute, so I’m glad to have the extra cooling capacity. 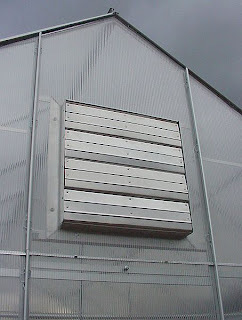 Normally people install an exhaust fan in one side of the greenhouse, and a shuttered vent in the opposite side, so there's a way to let air in (the vent) and a way to pull air out (the fan.) We're going to try using screen doors instead of the shuttered vent for air intake, so we only ordered the fan. One of the modifications we made to the back wall was the addition of a ½” x ½” aluminum angle (so we could screw the upper polycarbonate panels to something for strength in winds.) Now, we had to cut part of the brace away to install the fan. This is called Lack of Planning. We bought a 4’ length of 1/8” thick 1” x 1” aluminum angle from Lowe’s, and cut it in half. We drilled four holes in each piece of aluminum angle; the two center holes were used to bolt the angle to the fan. Here’s the fan in place, attached by putting bolts into the track and through the holes we drilled in each end of the aluminum angle. Putting this in place and securing the four bolts is one of those times when four hands are a lot better than two. Time to cut the hole in the polycarbonate panel. No pressure; just ignore the rumbling thunderstorm approaching. I measured the outside part of the fan, and the space on each side of the fan, and marked the hole on the panel using a permanent black marker. The poly was actually much easier to cut than I thought it would be, making several passes with a good sharp box knife and a metal straightedge on cardboard. Phew. The completed panel ready to be reinstalled, with the hole to fit over the outside portion of the exhaust fan. 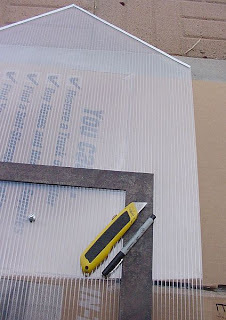 I won't be afraid to cut more holes in my polycarbonate panels if I need to...it's quite easy. Here’s the panel reinstalled over the fan. I later caulked around all four sides of the fan with clear silicone caulk, to keep rain and cold air out. I'll have to build some sort of cold weather cover for the fan for the coldest part of the winter...I can see small gaps between the louvers. Is that a black sky or what? 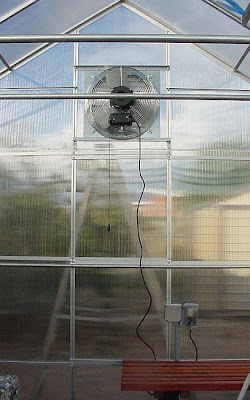 The installed fan from inside the greenhouse. It works! At the highest speed it's noiser than I'd like, but I'm getting used to it. Without this fan I wouldn't be able to keep plants in the greenhouse year round...our summers would be far too hot. With this fan in place, as well as some additional small fans for HAF (Horizontal Air Flow), and generous amounts of shade cloth, I'll have a fighting chance. It never rained a drop. All that bluster and no moisture. Welcome to the desert! I needed a way to have my heaters and exhaust fan turn on and off automatically, depending on temperature. I purchased thermostats from http://www.kkontrols.com/poth20co.html. Their price was good and their shipping was lightning fast. Some thermostats are designed to be wired directly into the heating or cooling appliance, but this pre-wired portable thermostat plugs into the wall outlet. 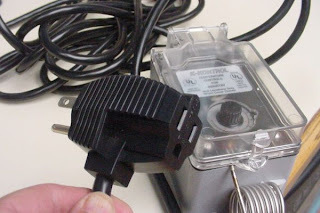 The fan (or heater) plugs into the back of the thermostat plug. 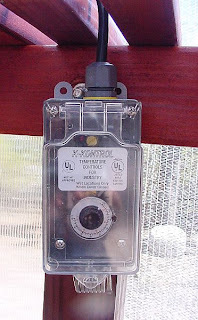 The thermostats from kkontrols.com come wired to use with heating appliances. To use it with a fan, you make a simple adjustment inside (moving two wires) as explained in directions they send with the thermostat. The location of your thermostats affects how often the fans or heaters will kick on. If the thermostats are located in full hot sun (or right in front of a heater) they won’t give an accurate reading of the real temperatures in the greenhouse. I bought an unfinished slatted craft box at Hobby Lobby. I pulled the slats off the bottom, and pulled one off on the top, to make room for my three thermostats. I used a dremel tool to make the cut outs for the tops of the thermostats, and I painted it white. 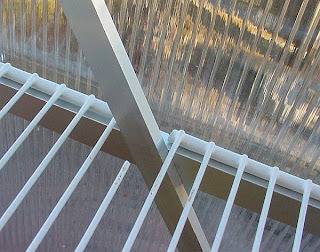 My hope is the slats and fabric will allow air to pass through for ventilation, and the shiny Aluminet surface will also reflect sun away. I'm really not sure this will provide enough shade for the thermostats...we'll see. I tried keeping the thermostats in the shade under my benches. This worked well, but I knew it would only be a matter of time before I accidentally poured water on them while happily watering plants. I decided I needed them in one location, protected from sun, centrally located, with good air flow, roughly at plant level, and where they wouldn’t hit me in the head. I spent a lot of time staring at my small greenhouse, trying to find a spot that would work. I finally hung the box from the EMT braces we installed at the top of the walls, over a bench. The back of the box faces the sunny south wall, and the open front faces the north wall. Visually, it's not the lovliest addition to the greenhouse, but if it will keep my heating and cooling systems working well, and keep my plants happy, I'll put up with it. It's annoyingly visible, but it's easy for me to access, and it's out of the way of plant tending. 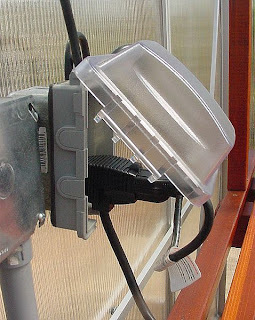 To get all the thermostats to the center of the greenhouse (from various outlets on different walls) I ordered them with 20’ cords, instead of the usual 8’ cords. This cost me about $5 extra per thermostat. I sealed the ends of each panel with aluminum tape to help keep dirt, condensation, and bugs out of the channels. I bought one roll of 1 ½” wide aluminum tape (not duct tape) at Lowes, and cut it into thirds, so I only have a small taped rim visible on the panels. 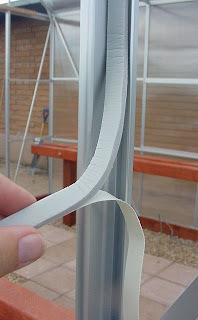 You can also buy polycarbonate tape from greenhouse supply sites. The panels have clear plastic on both sides that you remove before installation. If you remove the plastic you also remove the part number stickers, so I just peeled back the plastic several inches to tape the edges. Taping the panel edges isn’t hard but it’s a fairly tedious process. I brought mine indoors and worked on them in the evenings, laid out on the dining room table. 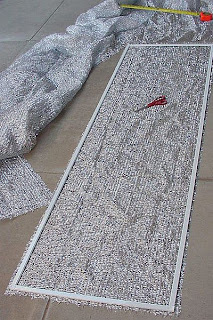 The top edge of each panel is completely sealed, as shown in the photo above. I used a tool designed to mark leather for stitching. When I ran this tool along the bottom edge it did a nice job of perforating the tape for me, and it was fast. I think a tracing wheel with teeth (used for marking fabric for sewing) might work in the same manner. Tip: Don’t tape the edges of the door panels (Part 64.) All the other panels are fine to tape, including the panels for the roof vent windows, if you want to. The eight door panels fit into tracks with a tight tolerance (especially if the poly panels have any kind of a burr on the cut edge.) The edges of these panels aren't exposed to the elements anyway, and if you tape them, they can be hard to fit into the tracks. I taped my door panels before I knew how the doors were constructed, and it was quite a battle to get them to fit into the door frame. Another BIG Tip: Store your panels in a cool place while they're waiting for installation. 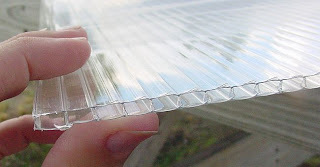 If you store the panels in the sun, the plastic protective covering can actually fuse to the polycarbonate surface, and it's very hard to remove. I stored my panels in the house while we built the frame, but it was about 98° when we started installing them. I found that even a half hour in direct hot sun made the plastic harder to peel off the polycarbonate, so be careful! 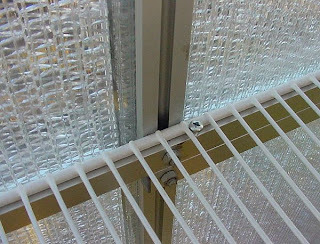 If your greenhouse is exposed to wind, a major problem with this kit is that the panels are only held in place with these small spring glazing clips. As a first step, many people recommend ordering extra clips. We ordered extra clips from Harbor Freight, by calling the 800 number on our manual (1-800-444-3353.) They seem to keep these in stock in the Harbor Freight warehouses, so in my experience they ship pretty quickly. (But it never hurts to order early.) We ordered one bag of 130 extra clips, and I used all of them, in addition to those that shipped with my kit. As of March 2013: If you are ordering extra clips for the Harbor Freight 10x12, the part number for the clip is 53, and the SKU number for a bag of 130 clips is 29457, price $15.99. If you are ordering extra clips for the smaller Harbor Freight 6x8 greenhouse, the part number for the clip is 46, and the SKU number for a bag of 72 clips is 27339, price $9.99. Super Important Modification Alert! Extra clips are good, but this step is even more important: screw the panels to the aluminum frame. So far, I haven’t read about any panels being lost to winds after being secured with screws. 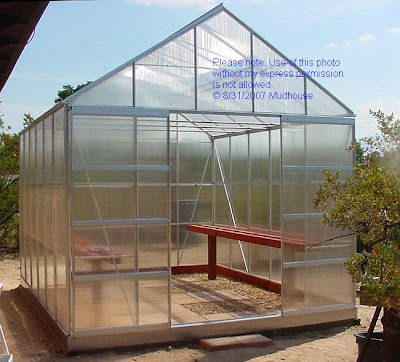 In my humble opinion, I would not attempt to build this greenhouse without attaching the polycarbonate panels with glazing clips and screws. I'm convinced this is important! Some people put one screw in the center of any brace crossing the panel, and some put one screw in the top and bottom of each panel. Some do both. We put one screw in the center of any brace crossing a panel. We tried to put screws in the top and bottom of the panels as well, but installing screws in those spots balled up the foam weather stripping I installed under the panels. (More about weather stripping below.) I'll probably decide to add screws to the top and bottom later, and I’ll need to cut out the weather stripping in the area where the screw needs to go. People have used many types with success. 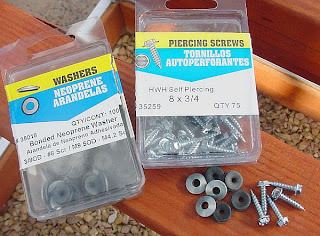 Self-tapping screws with integral neoprene washers, lath screws, or hex-head screws with aluminum washers all seem to work fine. We used No. 8 self-drilling hex head screws, and we installed a No. 8 neoprene washer with each screw. 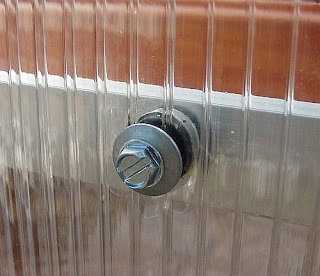 This is how the screw and washer look on the outside of the greenhouse. Most folks use screws from 1/2" to 3/4" long. 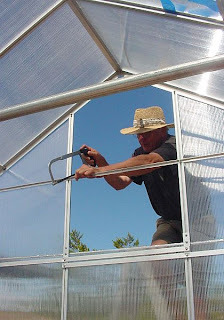 We used ¾” screws, but they tend to go through both layers of the hollow brace, leaving a sharp tip exposed on the inside of the greenhouse. I didn’t like that. We also found that screwing the panels to the braces resulted in a slight bowing-in of the panel. This is mainly a cosmetic issue; I just thought the panels looked better when they were flat, before we screwed them tight to the braces. To solve this, my husband used two of our neoprene washers, back-to-back, as a spacer between the polycarbonate panel and the aluminum brace inside the greenhouse. This spacer allowed the panel to remain flat, and it also made ¾” screws the perfect length. They secured the panel to the brace without poking through. Here’s a close up of the spacer made from two neoprene washers, but a nut or other washers would work just as well. 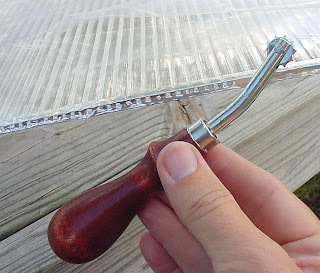 On the outside of the greenhouse, my husband started the screw through the polycarbonate. On the inside of the greenhouse, I threaded the "spacer" on to the screw threads before it was screwed into the brace. Here's a photo of the interior wall, using the spacers to keep the panels from being pulled tight to the braces. Red arrows indicate the spacers. Generally, I always used more clips for each panel than the manual directed (even on the small gable peak panels.) The kit comes with 260 clips, and I ordered 130 extra. By aiming for a total of ten clips on each of the side wall and roof panels, and adding a few extras to each smaller panel, I ended up with a couple left over. (I may actually order more to be able to add them as needed, if I see any places where the panels tend to move in winds.) 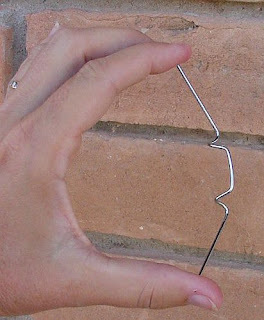 The clips aren't hard to reposition, and you can fine tune them as you need to. Don't forget to put the clips on the door panels too (I almost did.) I used one on each side of the door panel as per the manual. Some people also caulk the panels in place. This does seem to attach them securely and also closes down air gaps. I didn’t caulk because I’m hoping to replace some of the polycarbonate panels with fabricated screen panels in the summer, so I wanted mine to be removable. However, I did end up using silicone caulk to fill gaps in various places on the aluminum frame, especially at the top of all four corner posts. Instead of caulk, I used 3/16” thick closed cell foam weather stripping in each panel opening. Closed cell foam is waterproof so rain can’t soak in; look for "waterproof", "weatherproof", or "closed cell" on the package. 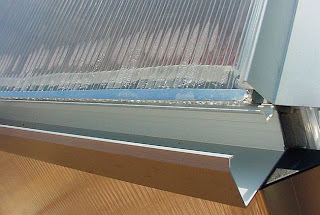 The biggest air gap is at the top and bottom of each poly panel; the panel touches the aluminum frame on the sides, but not on the top and bottom. One approach would be to only weatherstrip the top and bottom of each panel. I was worried about heating costs for the winter, so I decided to use weatherstripping along all four sides of each panel. This does provide a nice seal all the way around the panel, but it also dramatically increases the amount of material needed. I calculated the 10 x 12 greenhouse needed at least 560 feet of weather stripping. (That’s about 32 packages of 17’ weather stripping, each over $3 at Lowes.) 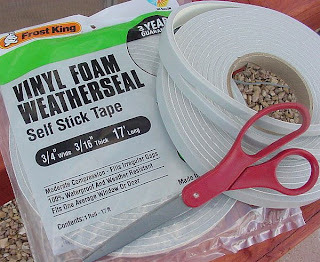 I found some packages of ¾” wide weather stripping on eBay for about 1/3 that price. I used that, cutting each strip in half with scissors, so it was 3/8” wide. It worked fine, and turned out to be a soft gray color that was hardly visible under the panels after installation. 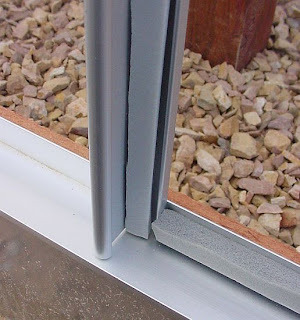 People either apply the weather stripping to the polycarbonate panels or to the aluminum greenhouse frame. 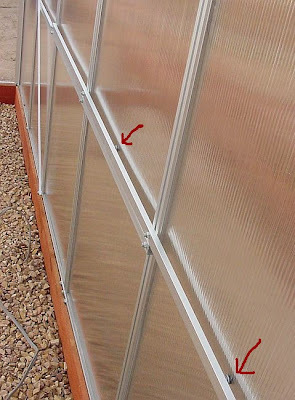 I didn't know how long the weatherstripping would last in our heat, and I thought it might be easier to remove and replace it on the aluminum frame than on the poly panels, so I put it on the greenhouse frame instead of on the panels themselves. This frame wasn’t really designed for weather stripping, and the panel openings don’t always have nice flat places to easily stick the foam tape. Sometimes I had to sort of balance the stripping on the high part of a ridge. I found the tape adhered very well, however, and once it was under the pressure of the panel, it formed a very good seal. I used two layers of 3/16" thick insulation, or one piece 1/2" thick, at the tops and bottoms of the wall panels, and at the bottom of the roof panels, as shown in the photo to the right. We found it was better not to apply weather stripping to the frame at the top of the roof panels, at the roof peak. The roof panels fit into a groove at the peak, and having weather stripping in place made it too difficult to slide the panel in. Instead, I later tucked ½” foam backer rod into the spaces at the peak. This closes the air gap and presses the panel up tight against the frame. It was just the right size to tuck firmly in place. Overall, I’m glad I weather-stripped the greenhouse. I think it will make a difference in the cold air infiltration in winter, and I think it also makes the panel clips grip better. However, it took longer for me to weatherstrip each opening than it did to attach the panel, so it does take time. Also, as mentioned above, the foam weather stripping might complicate adding screws to the top and bottom edges of the panel. 1. 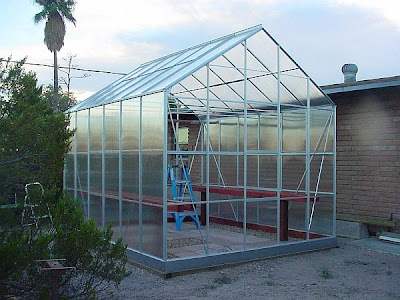 Apply weather stripping to greenhouse frame opening. 2. Remove protective clear plastic from panel. Mysteriously, some people report having this problem, and others don’t. We did. On page 16, the diagrams direct you to make sure the top of the roof panel (part 60) is tucked under the edge of the roof crown (parts 10,11) in the designated gap. And, it tells you to make sure the bottom of the panel extends past the edge of the gutter. Our panels weren’t long enough to do this. If we extended them past the edge of the gutter, they wouldn’t stay in place at the roof crown. If we tucked them securely into place at the roof crown, they fell short of the gutter, by as much as ¼” in some cases. If the way the panel fits above is truly incorrect, we've wondered if there was some tiny final adjustment at some point during the roof assembly that we missed. We really have no idea. Maybe they just ship out short roof panels on occasion! The mystery continues. 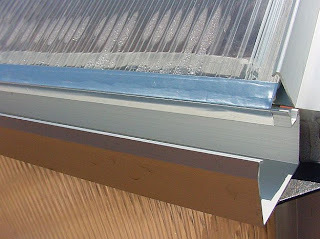 I noticed others used aluminum tape to cover the gap at the bottom of the panel, to direct the rain water into the gutter. I did the same, as shown to the right. I think it will work fine. (Update, May 2008.) After 7 months in our hot sun, the aluminum tape is still adhering beautifilly to the tops and bottoms of my polycarbonate panels (where I used it to keep moisture, bugs, and dirt out of the poly channels.) However, the aluminum tape I used to guide rainwater into my gutters (above photo) is no longer adhering to the roof, so I'm replacing it. Some kind of tape with UV protection might last longer, but I can't find anything like that locally. 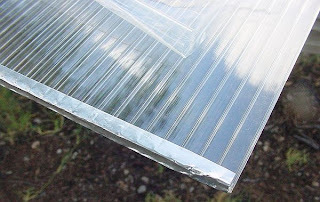 I'm using clear duct tape (Lowes) to bridge the gap between the bottoms of my too-short roof panels, and the gutters, and we'll see how long that lasts. 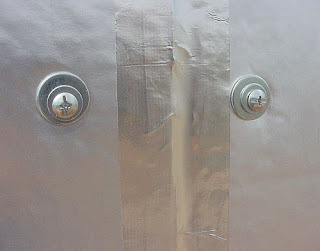 I also used aluminum tape to cover the seams of the tall polycarbonate panels on the back wall. The tallest panels on the back wall are joined together by two (VERY tiny) s-shaped clips. After these panels were secured, I covered the seam between the two panels with some aluminum tape to keep my winter heat from escaping. However, here's one thought: if you're going to be adding an exhaust fan to any of the tall panels in the back wall, as I did, don't tape these panels together until after you do that. You may want to remove the panel to cut the hole for the exhaust fan, and if you've taped it all in place, you'll be annoyed. Next day, panels are all complete. And, it looks like a greenhouse! Remember that old joke defining a boat as a hole in the water into which you pour money? Turns out greenhouses are the same thing, but they don't float. If you'd like to see how we continued to spend money on further enhancements, click here to go to Part Seven: Greenhouse Enhancements.